The 1890s was a momentous decade for women. Not only was the suffragette movement gaining worldwide momentum with New Zealand and South Australia enfranchising women, but sea changes in fashion also transformed the daily lives of women. 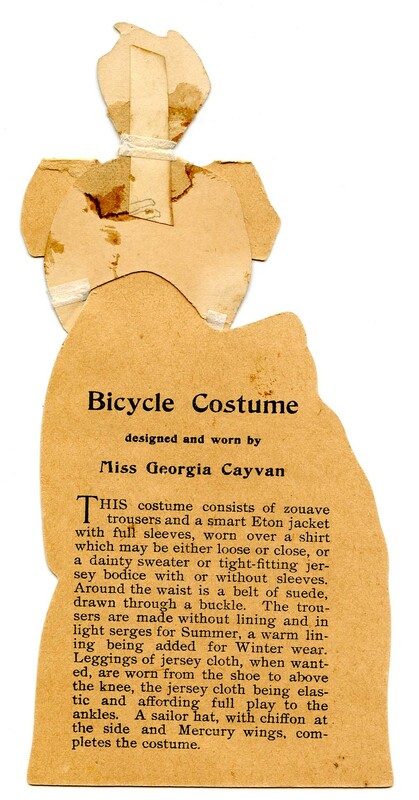 Despite dress reform advocates warning women of the dangers of tight corsets and fighting for sensible, non-restrictive clothing for decades, it was an invention that made practical changes which years of rhetoric could not— the bicycle. The bicycling craze swept the nation in the 1890s, with insatiable demand keeping nearly 2,000 manufacturers in business. Numerous manuals were published to instruct riders on road etiquette, proper breathing and riding technique, and accident prevention. Sometimes referred to as steel horses, bikes were a cheaper, faster, and more adaptable means of transportation that fostered both self-reliance and sociability. Earlier uncomfortable and unsafe models transformed into safety bicycles featuring cushion and pneumatic tires, coaster brakes, and most importantly a drop frame that was easier for women to mount and navigate. 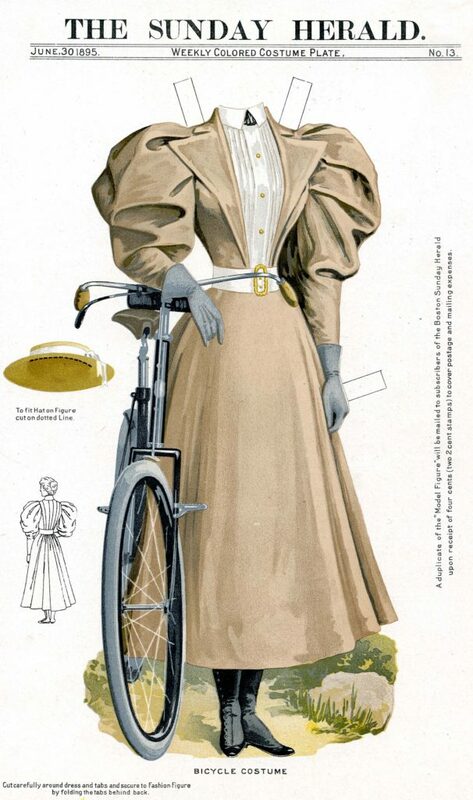 All this goodwill and interest in bicycling helped to propel the liberating direction that women’s clothing had been moving in. By 1890 the unnecessary bustle was finally eliminated, and the following decade witnessed shortened skirts (with extra fabric seemingly migrating to sleeves) and loosened corsets, enabling women to effortlessly cycle their way to good health and independence. The more radical bloomers, enjoying only a limited popularity since the 1840s, finally became widely accepted as the standard cycling costume for women. Paper dolls, helping to fuel the craze especially among young girls, easily and immediately sported the new fashions. With the print explosion in the second half of the 1800s, paper dolls were readily circulated in serial publications like newspapers and women’s magazines. 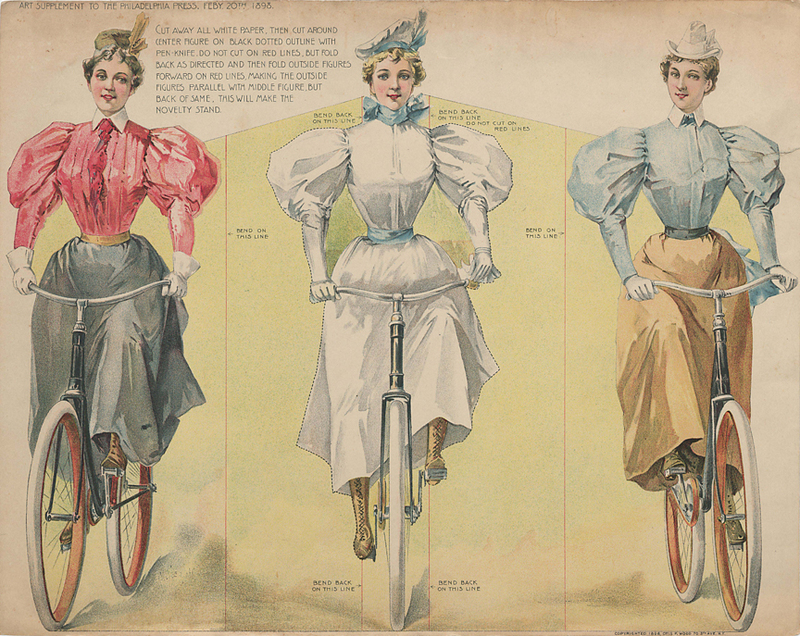 In the mid-1890s, the periodicals Boston Sunday Herald and The Philadelphia Press offered the latest cycling fashions for all readers to enjoy and imitate. Advertisers wisely created paper dolls as a tool in their marketing arsenals. The Pope Manufacturing Company, the largest bicycle maker in the world at the time, promoted its lightweight models to women and young girls through a series of dolls with detailed clothing descriptions. 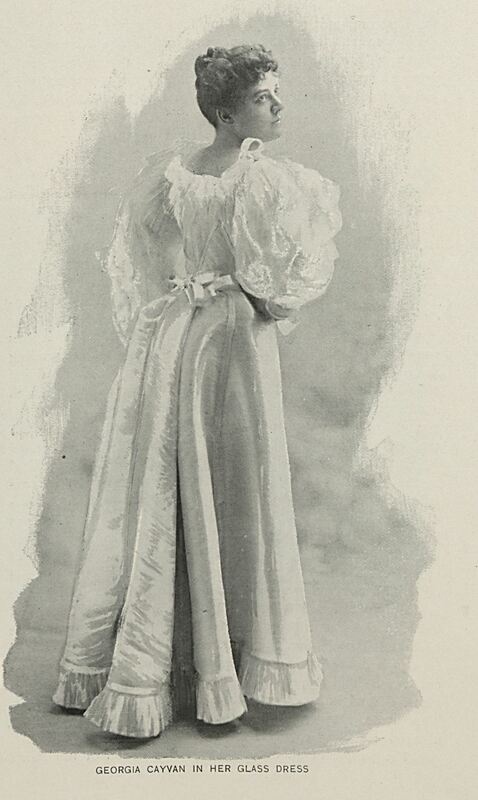 In a time when images of celebrities could be used without compensation, the stage actress Georgia Cayvan (1857-1906) may or may not have approved of her commercial appearance for Pope. At least her six outfits used in Pope’s promotion (a series mailed to anyone in exchange for five 2-cent stamps), were designed by leading couture houses like British high-end sportswear firm Redfern. Garbed in unlined, loose-fitting Zouave trousers, or bloomers, and a short jacket and face protected from harsh winds by chiffon, one Cayvan doll stands astride her Columbia bicycle ready for adventure. Although it’s unknown whether Cayvan actually wore an outfit such as this one, it was undoubtedly much more comfortable and practical than the Libby Glass Company glass dress she had donned and exhibited at Chicago’s 1893 World’s Columbian Exposition. Thankfully glass dresses never became a fad. 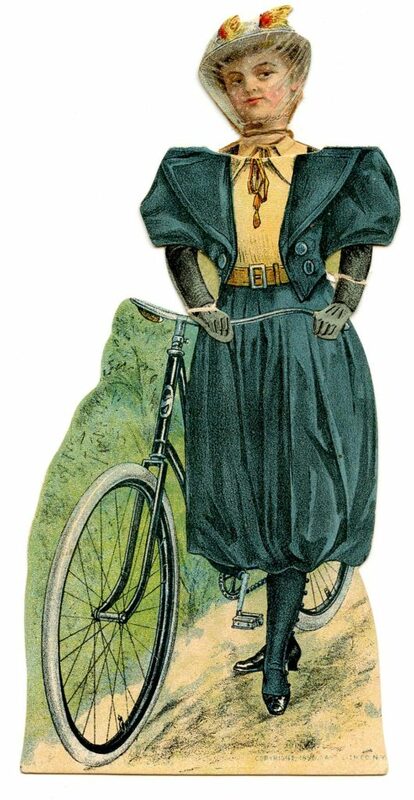 This entry was posted in Ephemera, Library, Uncategorized and tagged 19th century, bicycling, paper dolls, Winterthur Library, Winterthur Museum Garden & Library, women's fashion, women's history, Women's History Month. Bookmark the permalink.